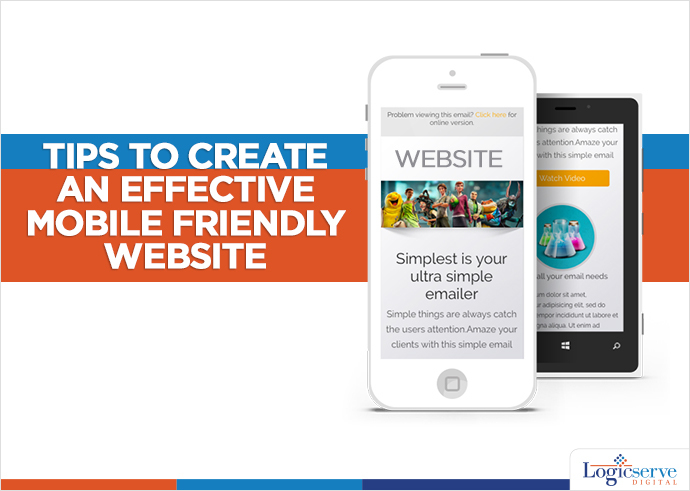 Tips to make your website easily accessible on mobile devices. The Smartphone has undoubtedly become our window to the outside world. With statistics indicating that India will have more than 650 million Smartphones by 2019, this window is only likely to become ubiquitous. Why do I need to make a website mobile-friendly? The portability offered by the Smartphone is second to none, making it the gadget of choice for anyone who doesn’t have access to a desktop computer or a laptop. It is for this reason that it becomes essential to optimize websites for use on mobiles, as a website’s desktop version is quite different from that of a mobile version. In order to improve the user’s experience on the website, and let them get the most out of the visit to the website, it is crucial to develop a mobile-friendly version of your desktop website. How is a website’s desktop version different from its mobile version? A desktop version is designed to fit the screen of the relatively bigger desktop computer. When the same website is viewed on the mobile, the contents are not optimized to be viewed on a smaller screen; the user needs to zoom in and out to view the contents better. Furthermore, websites with many images or high resolution images take more time to load on a mobile than on a desktop or a laptop. In a mobile version of the same website, the size and resolution of the images are optimized for quicker and more efficient loading. One needs to take into account the access to developer resources, expertise, and one’s business model before embarking upon the task of transitioning their website from a desktop version to a mobile version. Essentially, creating a mobile site involves taking parts of your current desktop site and establishing them in a mobile- friendly design. What are the top three factors I need to consider when designing a mobile site? Begin with outlining the possible steps that the site user may engage in. Simplify the process to ensure that each step is easy to complete on a mobile phone. Measure how conveniently the user can carry out their tasks on the mobile site. A user- friendly interface is the foremost factor that any visitor to your mobile site considers and appreciates. Using a Responsive Web Design ensures that the page uses the same URL whether the user is accessing the website from a mobile phone, desktop, or tablet. The core benefit of using such a design pattern is that you need to maintain only one version of the website as opposed to two which includes a desktop and a mobile version. With RWD, the website responds as per the screen size of the device being used to access the website. What are the different design patterns? And how does the search engine recognize my site across different platforms? With this design, your website’s URL as well as HTML code remains the same across all platforms such as mobile, desktop, and tablet. The only thing that changes is the way the content appears on the screen, depending on the screen size. It uses the same URL not considering the device type. However, it generates different versions of HTML depending on the device. Such a configuration identifies the device the user is using, and accordingly redirects them to the appropriate page. Regardless of the kind of configuration you may opt for your mobile site, your site will benefit from the added convenience that site visitors and users receive from the new interface.